Rochester and Strood Green Party have been accused of disrespecting the memory of fallen soldiers by refusing to observe the tradition of not campaigning on remembrance Sunday. 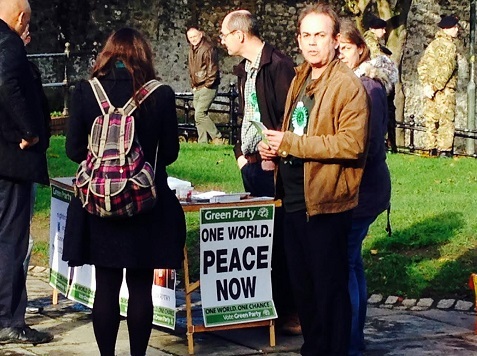 Activists where pictured without poppies, running an anti-war street stall ahead of the by-election on 20th November. Both the Conservatives and UKIP had hundreds of volunteers who could have been out campaigning today but instead asked them to stay at home as a mark of respect. The Green Party had no such sensitivity about the day and spent it running a high profile campaign. Breitbart London understands rival political parties were appalled by the Greens actions in a seat they have almost no chance of winning. One senior Conservative said: “Remembrance Sunday comes once a year, and it’s very sad to think the Green Party have chosen to ignore it. The Rochester and Strood by-election was called when Mark Reckless defected to UKIP and resigned from the House of Commons. He is widely expected to hold the seat, despite Conservative efforts. The Green Party are likely to poll less than 5 percent, and will therefore lose their deposit. The day was marked elsewhere in the country, the Queen led a memorial service at the Cenotaph despite police uncovering a plot to kill her at the event.